This 4th edition of our best-selling book integrates all of the HTML and CSS skills that are needed on the job with the proven instructional approach that made the first three editions of this book so popular. And now, this new edition includes chapters on Flexible Box and Grid Layout, which are the latest approaches to Responsive Web Design. For this edition, we also provide a lab manual in Print or eBook format that provides all of the student activities for this book. Your students can also purchase both the text and Lab Manual in eBook format as part of a VitalSource eBook and eManual bundle. In the 8 chapters of this section, your students will learn how to use HTML to mark up the content of web pages and CSS to present that content. In fact, by the end of section 1, your students will be able to develop web pages the way today’s best professionals do. That means they will be using the HTML5 semantic elements to mark up the structure of a page. They will be using float and the CSS box model. And they will be using a professional subset of HTML5 and CSS3 that consists of the most-used HTML elements, CSS selectors, and CSS properties. The last chapter in this section shows your students how to use Responsive Web Design so their pages will work on all screens, from mobile devices to computers. This, of course, is an essential skill for all web developers. That’s why it’s in the first section of the book. From this point on, the sections and chapters are written as independent modules, so you can assign them in whatever sequence you prefer. The two chapters in this section show how to use the latest CSS3 modules for responsive page layout: Flexible Box and Grid Layout. These modules let you build modern page layouts without using floating. That’s why knowing how to use both of them has become an essential skill on the job. Section 4 consists of two chapters. Chapter 17 presents today’s best practices for designing a website. And chapter 18 shows not only how to deploy a site on a web server, but also how to get the site indexed on the major search engines and directories. Because of the modular structure of this book, you can assign these chapters any time after section 1. This section (and book) ends with chapter 20, which introduces some of the third-party development tools that professional developers use...like Emmet, SASS, Bootstrap, GitHub, and Node.js. That will give your students some useful perspective on what they’re likely to encounter on the job. Most important are the two new chapters that show how to use Flexible Box and Grid Layout for page layout and Responsive Web Design. These have become essential skills on the job. In addition, there’s the new chapter on third-party development tools that are popular today. This provides a nice perspective on what can be expected in the real world. And although you can use any text editor you choose, this book now uses Brackets (instead of Aptana). So chapter 2 provides a short tutorial on Brackets. Beyond that, every chapter in the book has been improved, enhanced, and upgraded. That’s why this book works even better than the previous edition. We enhanced the test banks so there are more questions for each chapter, and we converted all of the completion questions to multiple-choice. We developed a new Health case study that you can use as an alternative to the Halloween case study. We offer a Lab Manual that provides all the student activities in a single manual as well as a VitalSource eBook+eManual bundle. Like all of our books, this one has our standard features, like paired pages, logical content organization, real-world examples, modular design, exercises that solidify your students’ skills, and much more. Here, though, are features that are specific to this book. In a modern website, HTML is used to define the structure and content for the site, and CSS is used to format the content. In other words, they always work together, and that’s the way our book teaches them...from the first chapter to the last. In contrast, some books start by first presenting a complete subset of HTML and then presenting a subset of CSS. But that means that the students don’t see the relationships between HTML and CSS until later in the book. Worse, some books have a section on HTML and a separate section on CSS. That may work okay for reference, but it doesn’t work didactically. 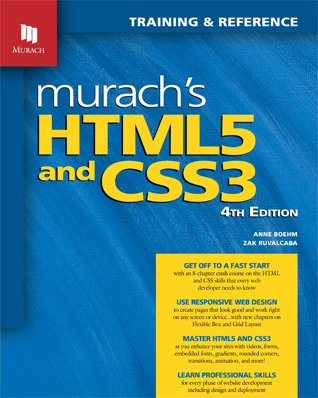 Many HTML and CSS books present web design before the students understand how a website is implemented with HTML and CSS. We think that’s a mistake. As a result, our book first shows how to build pages with HTML and CSS. Then, after the students understand how websites are implemented, they are ready to learn the principles of web design, which can be taught any time after section 1. Chapter 8 in this book shows how to build responsive web pages with fluid layout, scalable images, and media queries. It also shows how to use a jQuery plugin called SlickNav to convert the menus for a page to a form that works on mobile devices. Then, chapters 9 and 10 present the two latest CSS modules for page layout and Responsive Web Design. In short, your students learn all the skills that they need for building responsive websites at a professional level. User accessibility and search engine optimization are presented in chapter 1. After that, guidelines for accessibility and SEO are presented whenever they are relevant. For instance, when the <a> element is presented, the related accessibility and SEO guidelines are presented too. Like other books, our book has dozens of examples that show how HTML and CSS are used in a variety of contexts. Beyond that, though, our book presents a real-world application that is progressively enhanced from one chapter to the next. In fact, this application is a simplified version of a site that we developed for a local nonprofit that brings six speakers each year to its Town Hall meetings. Because of its modular design, this book also works for an introductory course that puts more emphasis on web design and less on HTML and CSS. In that case, you can teach section 1, select the remaining chapters that you want to include, and skip the other chapters. Then, your students can use the rest of the book in an advanced course or as a reference for their own work. Although your students can use a text editor as simple as Notepad to code HTML and CSS, we think that a text editor that includes syntax coloring, auto-completion, and error-marking will help your students build web pages more quickly and with fewer errors. That in turn means that they will learn faster. Of course, your students can use whichever editor or IDE you want with this book. If you don’t have a favorite, though, Brackets has some excellent features. To run and test web applications, your students should use at least two browsers. Since Internet Explorer, Edge, and Safari are installed automatically on Windows or Mac OS devices, your students already have one browser. Then, for the second browser, your students should install Chrome because it’s the most popular browser and because this book shows how to use some of its developer tools. That’s why the appendix in this book shows how to download and install Chrome. Besides the end-of chapter activities in the book and the student download from our website, here’s a description of what we offer. In brief, we provide all of the activities that other publishers provide...but without the busywork. The Lab Manual for this book presents all of the student activities in a single Print or eBook manual. That includes course objectives, chapter summaries, term lists, exercises, case studies, and projects. This Lab Manual insures that your students will have everything they need for the course, with the exception of the starting code that you’ll supply from the instructor’s materials. And it makes it easier for you to assign case studies and projects. This Lab Manual is available as a separate Print or eBook manual and also in a VitalSource bundle that consists of the eBook + Lab Manual. The instructor’s materials include a PDF version of the lab materials for the first 6 chapters of the book. If you like what you see there, you can request the complete manual by going to our Lab Manual or bundle page. On this page, we'll be posting answers to the questions that come up most often about this book. So if you have any questions that you haven't found answered here at our site, please email us at murachbooks@murach.com. Thanks!